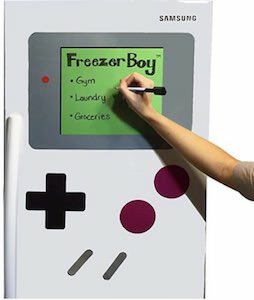 Now you can transform your fridge into a Game Boy with this Game Boy Style Fridge Whiteboard. If you like Nintendo and gaming then this set of 6 magnets is what you need as you can make your fridge look like a Game Boy and the screen is also a whiteboard so that you can actually use it for a shopping list or something like that. All you need is a metal surface and you can decorate it with this set of magnets. The Game Boy screen is 16 x 12 inches just to show you how big it really is. So make your fridge look cool with this Game Boy Style Fridge Whiteboard. 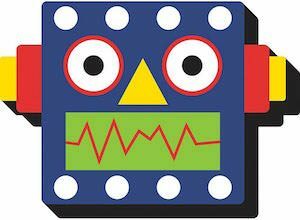 If you like robots and you have a metal surface that looks boring then this robot head magnet is what would look amazing on it. You can use the robot face as a fridge magnet and the droid will even help keep up notes for you. Or maybe your locker at school or work can use some dressing up in robot style. Now anything metal can be robot themed all thanks to this colorful robot head that even looks funny especially his teeth. So why would you choose not to have this magnet? Don’t wait just come and order your Robot Head Magnet. Of course you know all about that blue hand with the thumb up, the famous like button from Facebook. And now you can have a wooden version of that as a magnet. Just imagine having it on your fridge just for fun. You could also make it useful by putting it on your dishwasher pointing up when the dishes are clean and down when they are dirty. Now you can like anything made from metal as this magnet will stick to it. And unlikeing was never more easy, just remove the magnet and you don’t like it any more. 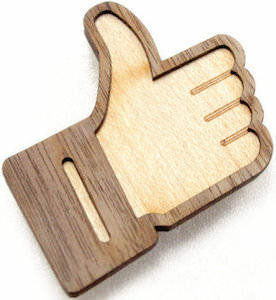 Come take a closer look at this fun Facebook Like Button Magnet. 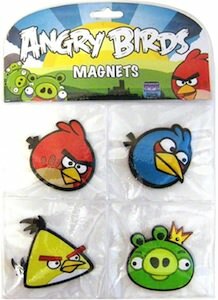 OK so you can’t play the Angry Birds game all day long but you know maybe this set of Angry Birds magnet makes you use you fridge more. Each magnet is fun and colorful and makes you fridge look amazingly more fun. So time to make metal look fun again with this Angry Birds Magnet Set. With Angry Birds Star Wars edition ready to be played you need of course some merchandise to. 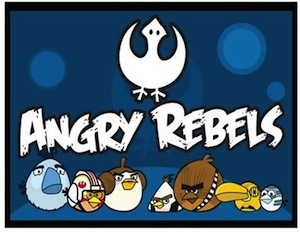 And that is where this Angry Rebels magnet comes in play with a special Star Wars Rebels logo and special Angry Birds all based on Star Wars. The magnet is 5 1/2 x 4 1/4 inch and looks amazing on almost any metal surface from your car to the fridge this magnet will make people stare. So don’t wait come check out this Angry Birds Star Wars Magnet. Any robot collector want this. 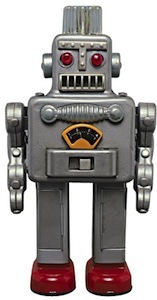 A magnet in the shape of a retro looking toy robot. The magnet is 3.75 x 2 inch and would look amazing on a fridge or any other metal surface. With a magnet like this you collection will be better then before. Don’t hesitate just come and order your Robot Magnet. 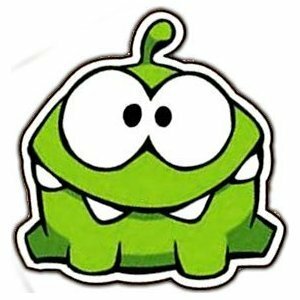 Do spend hours playing Cut the Rope just to feed you friend Om Nom? If so then you will enjoy this magnet as it is Om Nom. This flat magnet is 4 inch big and will look amazing on a clean fridge or other metal surface as this video game character really will stare at you. The fridge would be the ideal place form Om Nom as food is so close buy. Maybe he prefers candy but we can’t only eat candy can we? Come check out this Cut The Rope Om Nom Magnet. How fun would it be to make you boring old fridge in to a Android hangout? Having Google Androids hanging out on your fridge is easier then you think. 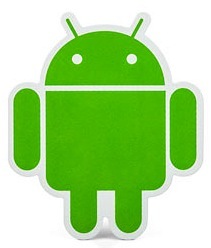 Simple just get one or more of these Android fridge magnets. These cute green magnets are 3″ tall and 3.4″ wide and will definitely make you fridge look fun. So if you have a boring fridge then don’t wait and order your Android Fridge Magnet. IOS users will recognize the picture above because the picture looks a bit like your screen of your iPhone or iPad. But these are not just app icons these are magnets. 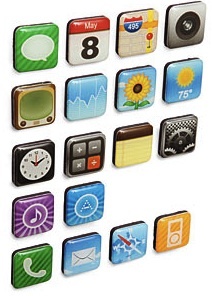 You can now own this set of 18 app icons that can decorate your fridge or any other metal surface. What better way to hold up notes then real app magnets. Go have a better look at these App Magnets. 1up is of course you favorite Nintendo Character and that is why you of course can’t have a life without this magnet. The 1up get a life magnet is great for the office or your fridge. Order your 1up Magnet today.